Information came from various sources including Vintage Guitar Magazine. 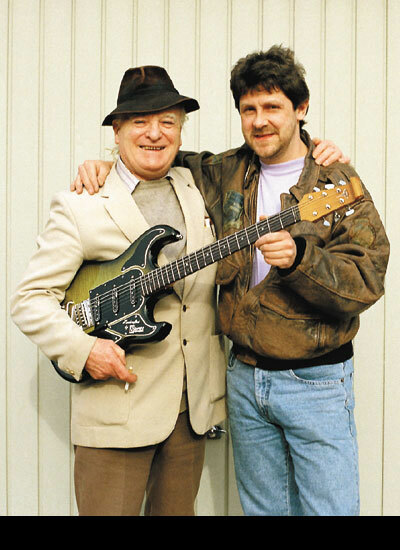 James Ormston Burns was born in England in 1925 and following World War II became involved in making guitars. In the late '50s he was part of Burns-Weill, making some of the earliest production guitars in England. During the era due to the high tariffs imposed on US manufactured products, UK guitarists looked to purchase domestically produced instruments or those manufactured in Europe. It was in 1960 that Jim Burns founded his own company, Ormston Burns Ltd., which began selling guitars branded "Burns London." Among his most endearing guitar designs were the pointy, horned Bison and a guitar made for Hank Marvin, England's answer to the Ventures. Burns guitars were generally well designed and produced, with feather-touch vibratos, a unique "gear-box" truss rod adjuster (which ended up on many Baldwin-era Gretsches), and nifty electronic features like the "Wild Dog" setting on the Jazz Split Sound (basically an early out-of-phase tone). Unfortunately Mr. Burns skills were guitar design and technology and not business and financial management. Within five years his company was deeply in debt to suppliers and creditors. He was in desperate need of capital to maintain his company. In '61, Lucien Wulsin III took over the reigns of the Baldwin empire based in Cincinnati Ohio. The name Baldwin conjures up visions of finely manufactured pianos and console organs. These were selling well, but due to the British Invasion, every kid across the world wanted to play electric guitar. Leo Fender was having health problems and decided to put Fender Musical Instruments on the block. Mr. Wulsin took a big chance to take his business in a new direction and made an attempt to purchase Fender, but was outbid by CBS. As a compromise Baldwin dispatched treasurer Richard Harrison to England to negotiate with Jim Burns about purchasing his floundering company. Due to the sad financial state of affairs of Burns Ormston. The reported purchase price was in the neighborhood of $380,000. This was far from the millions Baldwin had offered to purchase Fender. Most of the purchase price went to pay off notes. In September '65, Baldwin Piano and Organ took over the assets of Ormston Burns Ltd. Jim Burns remained on with his old company for about a year in a consulting capacity. New product development ground to a halt as Baldwin adjusted to the shock of inheriting a product line targeted at an entirely new market. Because Baldwin acquired Burns cache of guitars in the deal there were a few early models from 1965 that had both names on them, and those that did likely had already been produced at the time of the sale. Following these were some in-production models on which the Burns name was actually excised, and the Baldwin name inserted. Since the name was usually on the pickguard, this meant cutting out the Burns name and gluing a piece of pickguard material engraved with the Baldwin name over it. Once the existing Burns parts were used up, the Baldwin logo was incorporated into the parts, as normal. 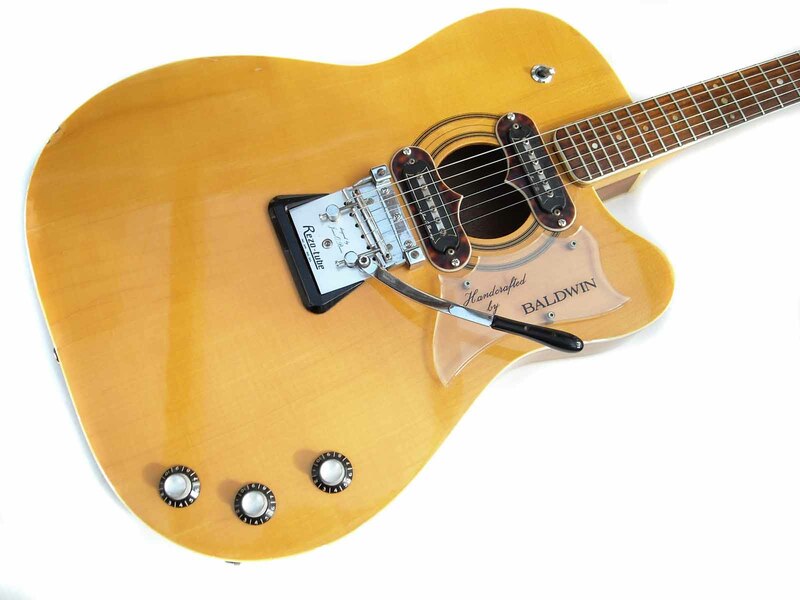 The 1965 Baldwin/Burns line included the Nu-Sonic, G.B.65, G.B.66, G.B.66 Deluxe, Bison, Baby Bison, Hank Marvin, Jazz Split Sound, Vibraslim, Double Six (12-string) and Virginian. 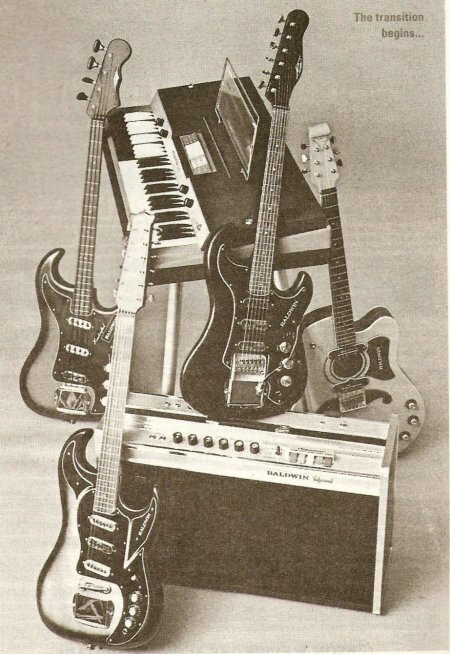 Basses included the Nu-Sonic, GB66, Jazz Split Sound, Bison Bass, Shadows, Baby Bison, and Vibraslim basses. Depending on the model, headstocks on most of these early Baldwin guitars were in-line, on-a-side or the trademark large scroll. Burns guitars tended to have a variously shaped clear plastic emblem stenciled with the model name situated on the headstock, with no Burns logo (which was engraved on the pickguard). With the exception of the classical, all Burns/Baldwin guitars had bolt-on necks. Necks were adjustable, with access underneath the neckplate into a geared mechanism usually called a "gearbox." Fingerboards were typically unbound rosewood with pearl dot inlays; the octave had a regular-sized dot in the center with a smaller dot on each flank. Burns guitars usually featured a zero fret. Pickguards were typically black/white laminated (tortoise on better models, in order to allow the engraving of the logo). Knobs were generally black plastic "Pilgrim hat" or "bell knob" types with a chrome insert on the top. Early Burns/Baldwin guitars were shipped directly to Baldwin's Fayetteville, Arkansas, electronic organ factory. There were a number of factors that precipitated this move from Cincinnati. The development of the Interstate highway system cut through Baldwin's lumber yard and there was an impassable struggle with the union. From the start, Baldwin encountered problems with the Burns guitars being shipped in from the U.K. "The problem was that Burns was using a polyester finish," recalls Krueger. "Not polyurethane - polyester. That worked fine for England, but when it got here it couldn't handle the climate change." Or, as Duke Kramer, who joined Baldwin later as part of the Gretsch acquisition, tells it more graphically, "The polyester finishes exploded!" Baldwin eventually hired a fellow whose job was just to refinish damaged guitars, but there were so many he never caught up! Baldwin guitars didn't sell very well. Baldwin had it's own stores that sold pianos and organs. There were other music stores that specialized in guitar sales. 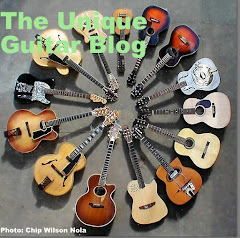 Guitar manufacturers sent salesmen to independent music stores to push their products. Baldwin attempted to sell guitars in their piano stores which attracted a far different clientele. 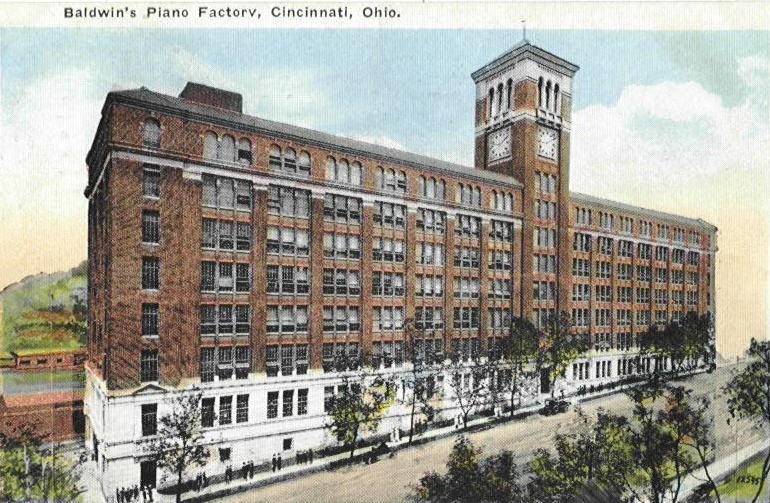 Baldwin's sales force was geared to pianos and organs. Baldwin also discovered the unforeseen cost of import tariffs. The tariffs were much higher on completed guitars than on containers of components. 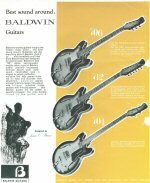 In 1966 Baldwin began having the Burns factory bring the guitars to a state of semi-finish, but not final assembled. Thus, they would pack one container with bodies, another with necks, etc. Apparently the state of completion would vary, but these were then shipped to Fayetteville, where the parts were assembled. Baldwin took further steps to reduce costs. Baldwin completely redesigned the guitars neck. First, from this point on, all Baldwin guitars had the same neck, rather than different headstocks based on the model. The new necks featured a flatter version of the scroll headstock which was easier to manufacture than the previous design, which had a real, carved scroll. The fingerboards were bound and the triple-dot octave had three dots of the same size. In addition, in '66 several models underwent minor changes, while the Vibraslim got a major makeover to become simply the prosaic Model 548. Although it looked the same the Vibraslim lost the internal wood and became a hollowbody. The old Ultra-Sonic pickups were replaced by new Bar Magnet units. Instead of mounting the controls with thumbwheels along the edge of the pickguard, they were now mounted on the top of the guitar. 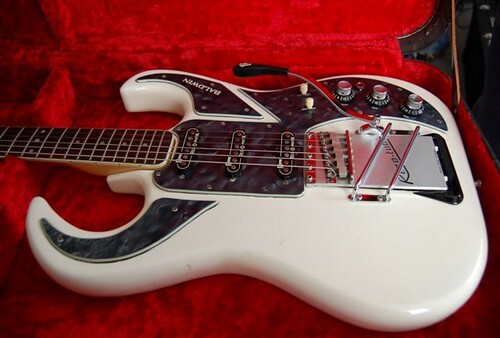 On some models, the laminated pickguard was replaced with a see-through plastic one. And the old Mk. 9 vibrato was replaced by the shorter Rezo-tube. Similar changes were made to the Vibraslim bass. Other minor model changes included new all-metal knobs on the Jazz Split Sound guitar and bass. The Shadows Bass was renamed the Shadow Signature. The Bison Bass, Shadow Signature Bass, Jazz Split Sound Bass, Baby Bison Bass, and Marvin and Baby Bison guitars all got new Bar Magnet pickups. Basses changed to a Rezo-tube bridge/tailpiece unit. The Jazz Split Sound Bass got a shorter scale. All got renewed expectations. In addition to the new specs, the entire line received new numerical model designations. Except for the Vibraslim, the old Burns names remained, but clearly de-emphasized. Baldwin poured a lot of money into marketing the new line. Lots of space advertising, an expensive catalog. Baldwin tried. Guitarist Chuck Thompson was hired as a demo man, Gretsch's Jimmy Webster, and he toured the country in a Baldwin van. 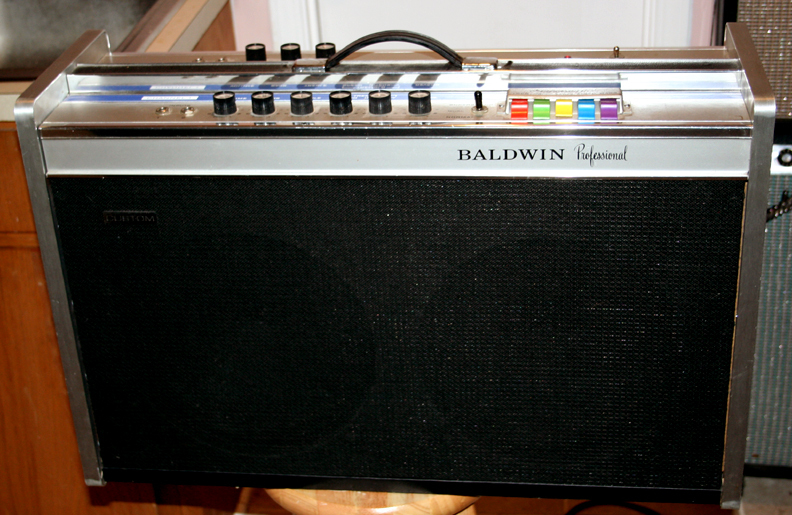 In '67 Baldwin decided to add a less expensive budget line, the 700 Series. The 700s featured conventional ES-335-style equal double-cutaway hollowbodies made in Italy and imported into the Fayetteville plant for assembly with Burns necks and other components, including some Italian-made hardware and probably pickups. 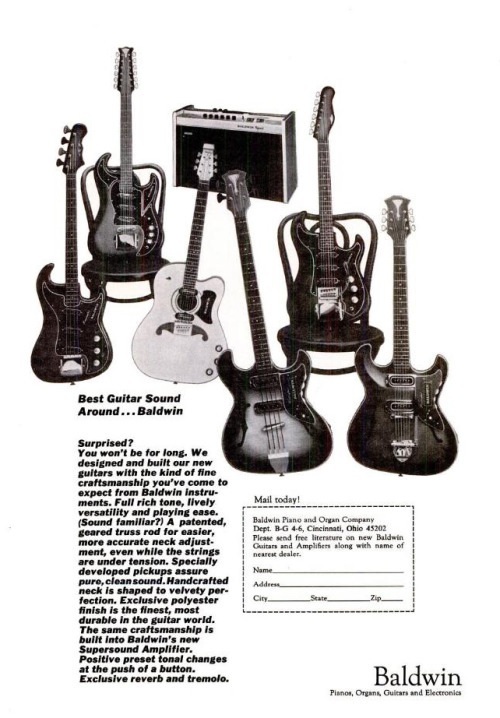 There were four guitars and one bass included in the 700 Series. 700 Series instruments came in cherry red or sunburst finishes. 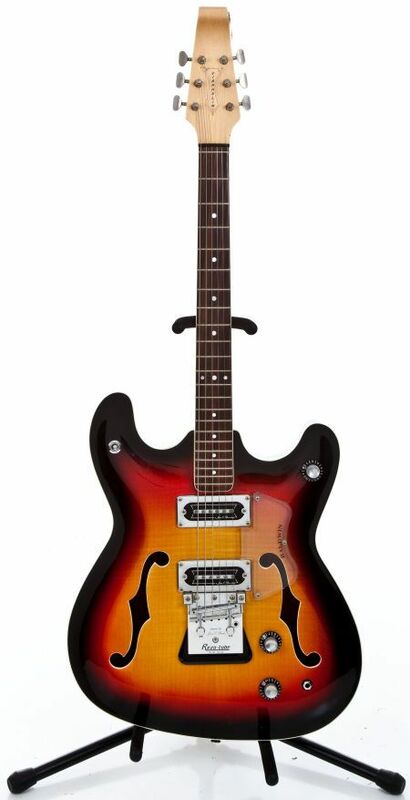 The Model 706V was a two-pickup thinline with the new Baldwin neck, an adjustable fine-tune bridge, and a Bigsby-style vibrato with string rollers and a stylized "B" on the backplate. The last two pieces look distinctly Italian. The pickups, mounted on metal rings, were a new "Bar Type" that appear to be humbuckers, and sure look Italian. These had metal covers with six adjustable screw poles on either side of a stenciled oval with the Baldwin name included. 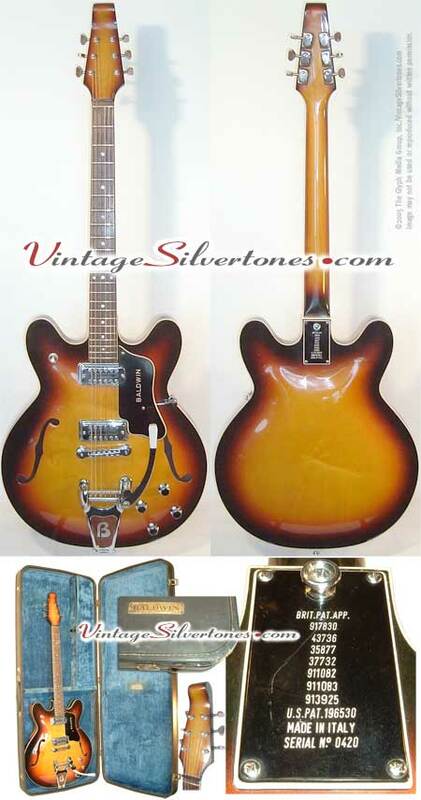 The Model 706 was the same guitar except for a trapeze tailpiece with a large "B" medallion. These are definitely different from the old Burns trapezes, and are also probably of Italian origin. 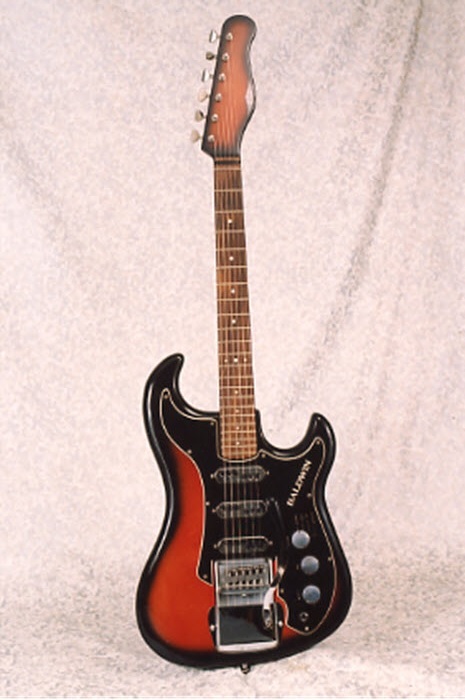 The Model 712 was a 706 with a 12-string neck. The saddles on the bridge were double notched, so it was essentially the same six string model converted to a 12 string and therefore probably intonation was a problem. The Model 704 was a bass version of the 706, pretty much identical except for two rows of four poles on the pickups and an attractive staggered tuner arrangement. Except for the 700 series, Baldwin guitars are excellent instruments. They were essentially domestic made Burns guitar. Burns was a sought after English brand especially the Double Six model. Jerry Reed's main guitar was a Baldwin Classical. 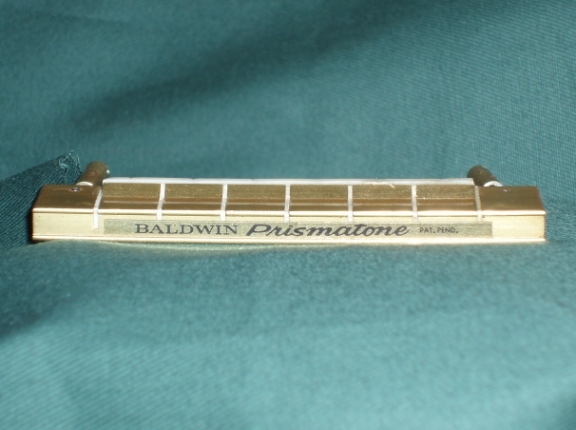 These were prized due to the prismatone piezo crystal pickups in the bridge saddle. This arrangement actually revolutionized acoustic guitar playing. Chet Atkins and his sideman Paul Yandell both had Baldwin guitars. 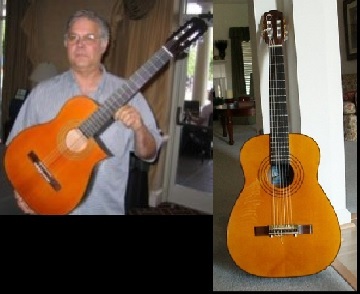 Chet removed the bridge saddle and used it on his classic models from luthier Hascal Haille. The same design went into Chet's Gibson model SST. Willie Nelson also removed the saddle pickup and placed it on "Trigger", his signature Martin guitar. We haven't discussed Baldwin amplifiers. These were solid state and based on the amplification system Baldwin used in it's organs. Willie Nelson has played through an amp, similar to the one pictured above, for years. The colorful organ style push switches on the right are called Supersound. These are treble, mid and bass boosters. The solid state amplifier is two channels, 45 watts with 2 - 12" speakers. The most remarkable amplifier was called the Baldwin Exterminator. This amplifier was an earsplitting 250 watts RMS and contained 2-15" speakers, 2 - 12" speakers and 2 - 7" speakers. It stood five feet high and weighed as much as a refrigerator. J'ai acheté en 1981 une Burns signée Hank Marvin. N° de série 800076. Je ne sais pas de quelle année elle est. What should I offer for a GB66 Bass? Hey, that's my old Virginian pictured up there. Picture taken by the 12th Fret shop in Toronto. Sold last year from St. Paul, MN now residing in Japan, I think. Had a couple unique features: silver scratchplate and dual toggles. Wish I could have hung on to it but had to pay bills. Thanks for this very informative look at Baldwin's foray into the guitar world. In 1967 I was a part of a pilot program, in Cincinnati, aimed at teaching guitar in the Jr Hi classroom. While most of the students played classical guitars I opted to play the bass. When it was decided that a core group of students would travel to the Peabody Conservatory to film a TV Special with classical teacher Aaron Scheerer I was given a Baldwin Vibra-slim bass and an Exterminator. Too bad it was just a loan, I would have loved to have kept this set-up. My parents on the other hand were more than happy to see the Exterminator leave our family room. It would literally shake the windows at settings above 2.5. I have a 69 v-s bass and need some parts for it. Any hope?? There are a few parts out there. What are you looking for? Hi There, I'm new to this blog and have joined to find out information on a pair of Baldwin pickups I have had since childhood which were given to me on a custom guitar project from my dad's friend. They are likely to be late 60s to mid 70's and have never really been played. Does anyone know where I can best advertise these to make sure they go to a good home. They are chrome with two lines of adjustable screws on each side of the Baldwin name. One has red/black wire the other blue/black. Any body have a pick guard for a 706 or 712? I also need a tone knob. any help would be greatly!! appreciated. I need to buy an original bridge for my Baldwin Jazz Bass guitar and also a machine head. I'm looking for an example of a finish I saw on 2 Baby Bison Basses back in the '70s. It was a burgundy/fuscia/natural sunburst. The guitars were in retail stores and being sold as new. The stores were on opposite ends of the earth. These things lead me to believe it was a factory finish but I've been told it wasn't and I've never seen such a finish again. Any help? Hi, My old friend has passed away and I would like to help his wife sell his instrument collection. He has a Baldwin 6 string bass, serial number 18329 that may have been designed or made by James O Burns. I' m a keyboardist and know little about guitars. How can I make sure she gets a good price for the instruments. She also must sell a Gibson j150 sr# 03441013, gibson J45, Fender DG22CE, Fender Mandolin FM53S, all in great condition with cases. Please respond to lynncrochet@verizon.net. Looking for parts to fix up my 76 year old dads Baldwin guitar. Its antique and unique. Made at D. H. Baldwin Co. in Cincinnati Ohio. Have model and serial numbers. Any help is appreciated. Did Jose feliciano play a Baldwin classical in the early days of his career? Hello Tim, what model Baldwin is your dads? A classical or electric guitar? In the summer of 1966 I worked with Clyde Edwards at Baldwin in Cincinnati making a pilor run of hollow body guitars. I never got to see any of the finished guitars and have always wondered what happened to them. Any comments? There were a few hollow bodied guitars that were build as prototypes. They had one of the first Prismatone pickups. I don't know if Clyde Edwards was involved. I've owned a Burns Vibraslim from May 65 serial 18047 for 30 years. It's time to consider giving someone else the chance to own this vintage original. Any advice on how to go about finding a collector would be appreciated. Hi, I look for a book on the Baldwin 801CP. How can I determine the date of the construction? is there a mark inside the guitar? a code? 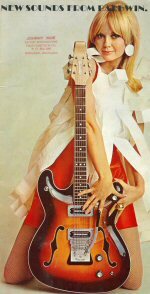 I look for also an original print ad from 60's - 70's to buy. Somebody can propose me? As to the clyde edwards guitars,I have two of them....they are similar semi or full hollowbodies with sharp cutaway similar to a Super Chet Gretsch Each is slightly different and the. may have Bar magnet pickups and not any prissmatone pick up. Not sure if even the necks are Burns but the Clyde Edwards connection whatever it may be drew me to them.I have roughly 40 Burns/Baldwin/hayman guitars......and live in the states/what a strange journey it has been.........also have a fondness for Ned Callan guitars. how do you adjust a late 1960's baldwin 704 semi hollow bass truss? I'm the proud owner of a 1968 Baldwin Baby Bison electric guitar and desperately need a couple of parts to restore it to its original status. First I need a bridge pickup; it's open and these are encapsulated in plastic, so I can't rewind it without ruining the packaging. The other part is the little plastic liner around the Rezo-Tube vibrato cavity. Any help anyone can provide will be greatly appreciated. Thanks in advance. Does anyone out there know the value of a Clyde Edwards guitar. A neighbor of mine has one that was hand made for him. He wants to know what it is work. No cut out on body. Seems to have inlay on fret board. Plays well after all these years. The neck seems to be attached the way a violin neck would be. Anyone have a clue? I am looking for an original (if possible) bridge for a 1966? Baldwin Burns bass. It looks like a Vibraslim, but without the logo. Anyone have one, or can suggest a suitable aftermarket one? I can't seem to find anything on this guitar. It belonged to my father who worked for Baldwin before and during the time when Baldwin bought Gretch. Can anyone help feel find out what I have. I have a 68 baldwin 801cp guitar I'm selling. All original and all parts are there. Hi, I have a burns Baldwin double six serial number 20317 and have 2 questions. 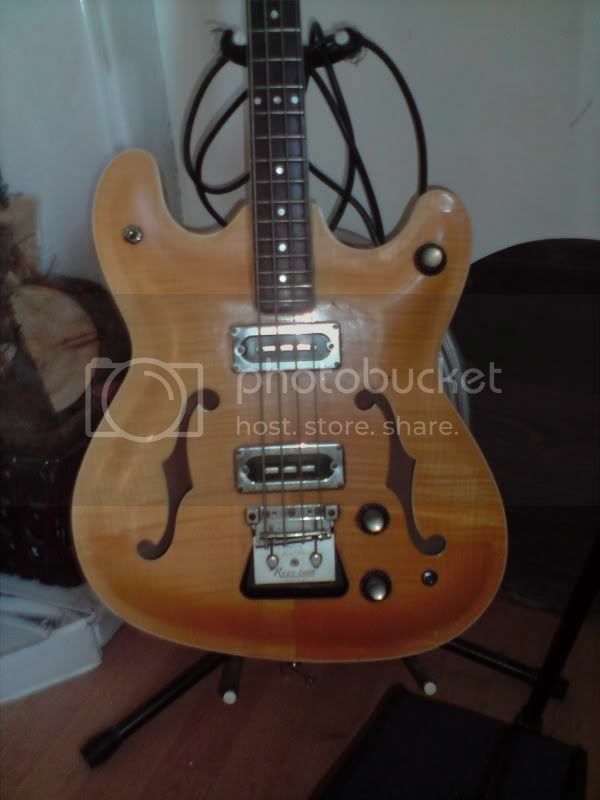 Firstly, how can I date the guitar as it was sold to me as a '61 but I want to be sure as I am trying to sell it and want to be as accurate as possible? Secondly, one of the hat shaped knobs has been chipped so I want to replace it but I am having trouble getting it off, is it a very small Allen key or something completely different? I have a Clyde Edwards Model 601 as shown on the Gretsch lost weekend blog. I know it's a unique guitar, it's in fantastic condition and want to insure it..Anybody help with a valuation? Hi Sandy, I would like to buy that guitar from you. Could you send me an e-mail? hendriksibma [at] hotmail [dot] com. Thanks in advance, Hendrik. Does anyone know of a good blog for the Vibraslim line? Just have some questions regarding my own Vibraslim. Thanks! I have a 1965/1966 Baldwin Jazz Bass and I need a tuning machine knob for it or a complete tuning machine gear with knob. I bought this bass new in Winchester, VA back in 1966. Contact me at rwhare2@twc.com if you know of any parts. Hi, I have a Baldwin 706v serial 0359. It is in immaculate condition. Looking to find it a new home. Please email me at brentaburgess at gmail. Thanks. I own a Baldwin 12 string solid body electric Serial #15539. It has 2 pickups rather than the 3 I usually see pictured. Excellent condition for a 50 year old guitar. It's been played very little over the years - frets show no wear at all. Brit Pat App numbers on the neck plate as well as U.S. Pat #196530. Made in England also stamped there. Burns Tri-Sonic pickups. Brown sunburst. I am interested in selling it and can send pics to anyone who would like to make an offer. Start following our trades today & profit up to 270% a day. In regard to the Clyde Edwards 600 series hollow body 1966. I have one. If anyone is interested in seeing it email me at Glen.forde@hotmail.co.uk and I'll send some pictures over. 1965 BALWIN, SPLIT SOUND JAZZ ELECTRIC AND ORIGINAL CASE. GREEN BLACK TRIM, URATHANE FINISH. LIKE NEW! 3 PICK UPS AND CHEATER BAR ETC. MADE IN ENGLAND. WILL NOT SHIP DUE TO ITS VALUE. WORKS AND SOUNDS LIKE IT DID NEW. I STILL PLAY IT TODAY.